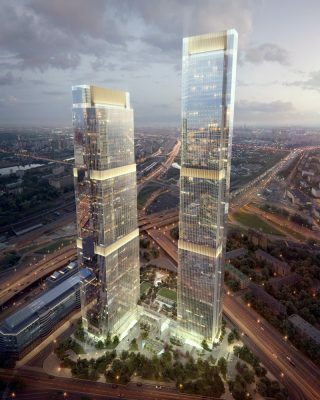 Today, the flagship project of Renaissance Development, Neva Towers, is a modern multifunctional estate in Moscow City business district, covering the area of 2.41 hectares. The estate is made up of two buildings united by a common stylobate. The towers are nearly 290 and 338 meters high (63 and 77 floors). The total area is 350,000 sqm mostly occupied by apartments. The parking space can hold 2,040 car units. The stylobate roof has a private park and a swimming pool with an outdoor jacuzzi. In addition, the estate contains offices and a retail gallery. The number of apartments is 1,210, with the floor area ranging from 60 to 300 sqm. The apartments are supplied as “white box” solutions”, i.e., completely prepared for applying finishing materials and customized design. The architectural concept has been developed by the star team of HOK (USA), FXFOWLE (USA) and SPEECH (Russia). The public interiors are being developed by the renowned international firm HBA/Hirsch Bedner Associates. The project envisages a club infrastructure including: a panoramic swimming pool, a fitness club with a spa studio, squash courts, a virtual golf area, a cinema hall, music and karaoke studios as well as rooms for one-to-one training sessions. 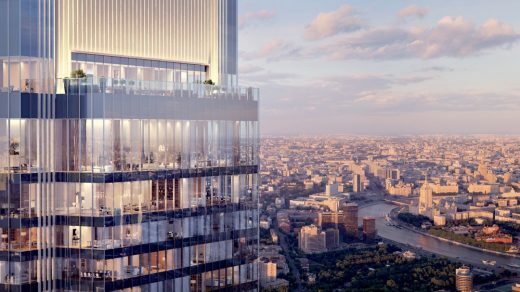 NEVA TOWERS is the only estate offering a unique view of the whole Moscow City district. The design and construction are being carried out in compliance with LEED (Leadership in Energy and Environmental Design) standards of the American Council for Environmental Construction. Neva Towers has applied for the LEED GOLD certificate. •	Designer architecture, timeless style (for skyscrapers), the star team architects and developers. •	Unique concept of an estate with its own park on the 4th level and infrastructure enabling to live a full life. •	Convenient apartment mix. At the sale kick-off, customers can choose two- or three-bedroom apartments from 60 to 95 sq. m located on the 5th to 28th levels. •	Customer focus. All apartments are offered on the “white box” terms, i.e. fully prepared for finishing work and customized design solutions. Personal touch in a home is vital and the company will ensure that it is easy for the customer to create a unique look of their apartment. 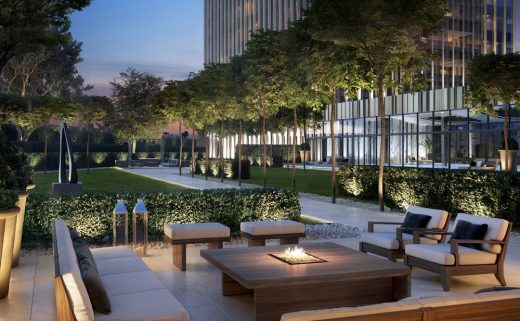 •	The estate public space interiors are being developed by the world renowned HBA/Hirsch Bedner Associates. HBA/Hirsch Bedner Associates has been responsible for the design of the leading luxury hospitality brands like Hilton, Marriott, Fairmont, Hyatt, Sheraton, Four Seasons, Mandarin Oriental, Ritz Carlton, Waldorf Astoria, etc. •	The perfect location of the estate and its transport infrastructure make it easy to get to offices, shops, restaurants, theaters and galleries in the historic area, to international airports and railway stations (our customers travel A LOT on business and otherwise) and commute in the prestigious western suburban direction. •	The unique view of the Moscow “Manhattan” – Moscow City – exclusively from NEVA TOWERS.